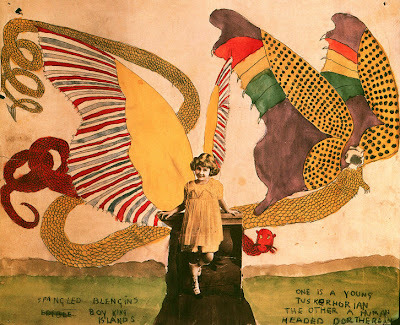 The World Needs A Stronger Blog...: Henry Darger: The Mind Of A Child? Henry Darger: The Mind Of A Child? Henry Darger was to art what Wesley Willis was to music. Henry was one of those people hardly anyone notices, who, seemingly, move through life as sad shadows. Born in 1892, possibly in Brazil or in Germany by his various accounts and perhaps bearing the surname, Dargarius, young Henry lived with his father- "a tailor and a kind and easygoing man" in Chicago until 1900. Henry's dad died in 1905 and his son was institutionalized as feeble-minded, apparently on the basis of a doctor's diagnosis that "Little Henry's heart is not in the right place." Henry tried to escape, unsuccesfully, a number of times and finally he broke out in 1908 at 16-years-old Henry Darger found menial employment in a Catholic hospital. A job he would have for the following 50 years. His life took on a pattern that seems to have varied little: he attended Mass daily, frequently returning for as many as five services a day; he collected and saved a bewildering array of trash from the streets. His dress was shabby; he was a solitary. In 1930 he settled into a second-floor room on Chicago's north side. It was in this room, more than 40 years later, after his death in 1973, that Darger's extraordinary secret life was discovered. Amid a pack-rat's mountain of garbage - including hundreds of empty Pepto-Bismol bottles, nearly a thousand balls of string, old newspapers, magazines and comic books, religious kitsch and much more- his landlord, who just so happened to be photographer Nathan Lerner, found a creative life's work: an enormous literary and pictorial production that no one ever, ever knew about. 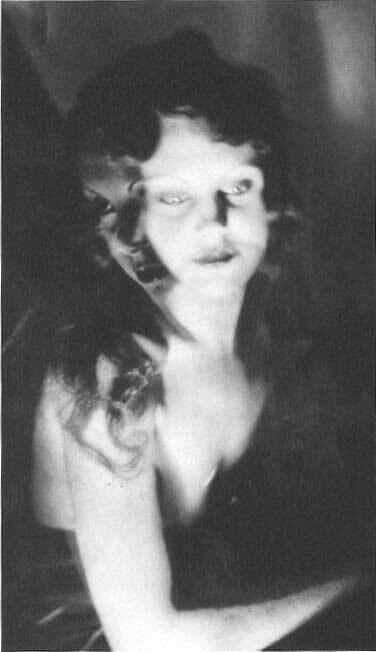 The key element was a picaresque tale in 12 massive volumes composed of some 19,000 pages of legal-sized paper filled with single-spaced typing entitled "The Story of the Vivian Girls: in what is Known as the Realms of the Unreal, of the Glandeco-Angelinian War Storm, Caused by the Child Slave Rebellion." The origins of this epic appear to be in 1909. It took more than eleven years to write it in longhand; in 1912 Darger began the task of typing the still incomplete manuscript. The story recounts the wars between the nations on an enormous and unnamed planet, of which Earth is a moon. The battles are full of vivid incident: charging armies, ominous captures, storms and explosions, the appearance of demons and dragons. Above: Henry's original writings as found. Darger possessed a wealth of information about military matters and particularly about the Civil War. Not surprisingly the details of battles are recorded in precise quartermaster style in supplemental volumes. In one, for example, he carefully drew and colored the hundreds of flags of the warring nations. Another lists literally thousands of names of officers in the contending armies and their fates (among these, some are described as “killed” while others are “mortally wounded”.) The true heroes of these adventures, however, are children- the favourites of god, according to the author. The epic’s happy conclusion is only reached after his young protagonists survive great trials, including humiliation, enslavement and torture. By far the most important supplement to the book, however, exists in the several hundred watercolor paintings Darger left in his room, many of them illustrations for The Realms of the Unreal. They transform Darger’s apocalyptic text into a body of images that are among the most original and beautiful in outsider art. These works- pencil drawings on paper painted over with watercolor and occasional additions of collage- illustrate incidents in the book with a precision and amplitude of detail not possible in a written narrative. Textual annotations are also typically parts of these compositions, suggesting that picturing the reality of the event by every means available was a pressing need for the artist. The sizes of Darger’s work range from the measurements of standard drawing pads to mural-sized works made of joined sheets of 3 or 4 feet high and as much as 10 to 12 feet long. The sheer number of large format works makes it clear that Darger conceived the epic format as appropriate to the dimensions of his vision. Because artists’ materials were costly, Darger’s sheets usually contain finished, independent compositions on both sides. The logistics of how Darger was able to work on these large pictures in the cramped quarters he occupied are remarkable. With the only possible conclusion being that he worked in the manner of scroll painters- one segment at a time. But if this is the case, memory had to be relied upon to govern the overall coherence of these exceedingly complex compositions. Darger was certainly an untutored artist in any traditional sense and his work, like that of other outsiders, stands outside of the history of art. He probably never visited a museum and had only very limited exposure to art. Yet his creative sensibility was such that it was possible for him to spin gold from the daily experience and fantasy, which in his mind easily co-mingled. If Darger was largely ignorant of art in the museums, he was in close touch with the abundant imagery of popular culture available to the pack-rat collector. Topical events are continually reflected in his texts and images just as cut-outs from newspapers and magazines, comic books and religious tracts easily found a place in his visual narratives. 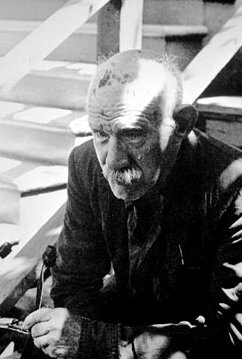 Like all genuine talents, Darger developed a set of techniques that was at once individual and entirely adequate to his expressive requirements. Darger’s method was to simply trace images from children’s book illustrations, comic strips and similar sources. If the needed image was not of the required size, the artist would take it to the photography counter of a near-by drugstore and have it enlarged or reduced to the proper measurements. Frequently favourite images were repeated in a given picture as well as additional works. 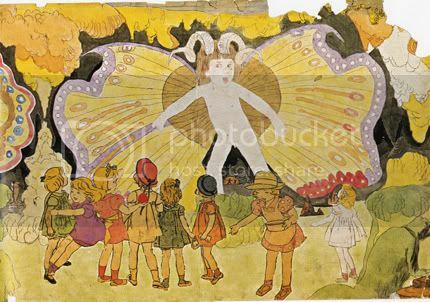 Other elements deemed suitable- butterfly cut-outs, Mickey Mouse and Donald Duck, fragments from colouring books and game boards and many more- were confiscated into Darger’s pictures and, because of the easy alliance in them of the real and the imagined, seemed perfectly at home. Darger’s particular brilliance lays in a keen organisational sense. His major compositions bring together massive casts of characters in ways that surely would have gladdened the heart of a Cecil B. DeMille. These elaborate forces are deployed with a sure eye for intricate, often cunningly balanced relationships that activate the entire picture plane. Darger’s compositions are commonly set in expansive landscapes or, somewhat less frequently, in interiors, both particularly well-suited to the horizontal format he favoured. As a child, Darger witnessed a devastating tornado, and skies with rolling clouds and electrical fireworks are often present in his more turbulent scenes. I benign settings the artist contrives rich and colorful patterns in depictions of crowds of children, flowers and radiantly colored insects. The only possible response in such instances is that art, being often fashioned from artists’ obsessions, is rarely a vehicle for the description of perfection: Darger created art from the visions available to him. Much modern fascination with Darger concerns his portrayal of horrific brutality displayed against children. It is sometimes assumed that Darger wrote and drew this way because he was enacting repressed subconscious desires; Darger's posthumous biographer, John M. MacGregor has speculated that Darger may have been the culprit of the 1911 strangling of Elsie Paroubek. Viewers are also perplexed by the clearly androgynous anatomy of Darger’s nymphettes, curiously enough a trait never in evidence among the seven angelic Vivian girls. It is not possible to fathom the causes or intricacies of Darger’s fantasies, but it should be said that his public behaviour appears to have been without blemish. A saintly man who frequently attended Mass, Darger saw himself as the ardent protector of children. He could, therefore, in his words and images, subject his creatures to terrible trials from which it was in his power to rescue them. The wars, fires and tempests that form the context of his art undoubtedly reflect an unconscious conflict that seems to have given him little respite. 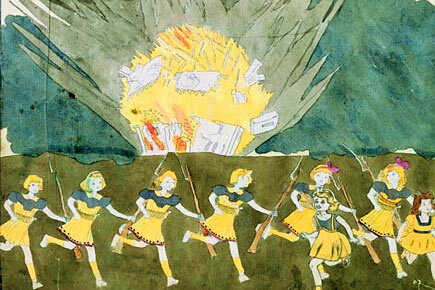 God was Darger’s protagonist and consequently the conflict could be nothing less than cosmic. This poignant struggle is extensively documented in the artist’s diaries, which record by turns his pleading and rancorous exchanges with the Creator. If Darger’s fantasies often hovered on the fringes of sanity, his art enabled him to transform his obsessions into a luminous production that, in its best moments, transcends the pain and circumstances of its making. Waitin' for the Double E?